During my regular visits to London, I have tried to visit Saint Stephen Walbrook, which is next to the Mansion House and near to Bank and Monument Underground stations, and the architectural historian Sir Nikolaus Pevsner lists it as one of the 10 most important buildings in England. This is the parish church of the Lord Mayor of London, but it is best-known for its dome by Sir Christopher Wren, the once-controversial altar by the sculptor Henry Moore, and its associations with the founder of the Samaritans, the late Canon Chad Varah. When I was in London three weeks ago [9 May 2018] for a meeting of the trustees of the Anglican mission agency USPG (United Society Partners in the Gospel), I arrived at Wren’s domed church early in the morning before it opened, and late in the afternoon shortly after it had closed. But it remains high on my ‘must visit’ list. There was once a seventh century Saxon church here, and this was probably built on the foundations of a second or third century temple of Mithras. In this temple Roman soldiers sought valour and virility in shower-baths of hot blood from slaughtered bulls. After the recall of the legions to Rome in 410 the building became a quarry. 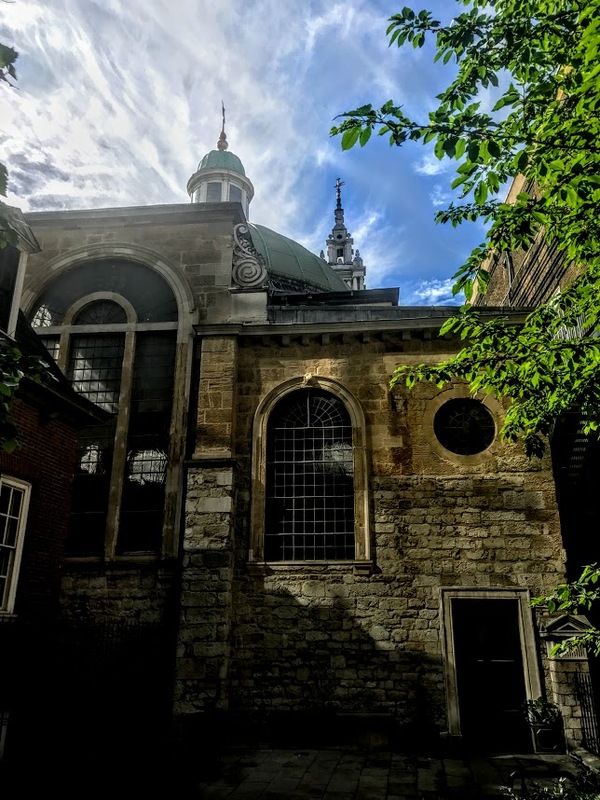 The original Church of Saint Stephen stood on the west side of the Walbrook, a brook or stream running south across the City of London from the City Wall near Moorfields to the Thames. This brook was later concealed in a culvert. Saint Stephen’s Church is first mentioned around 1096. In 1100, during the reign of Henry I, it was given by one of the king’s courtiers, Eudo, to the monastery of Saint John at Colchester. The church moved to its present site, on the east side of the Walbrook in the 15th century. 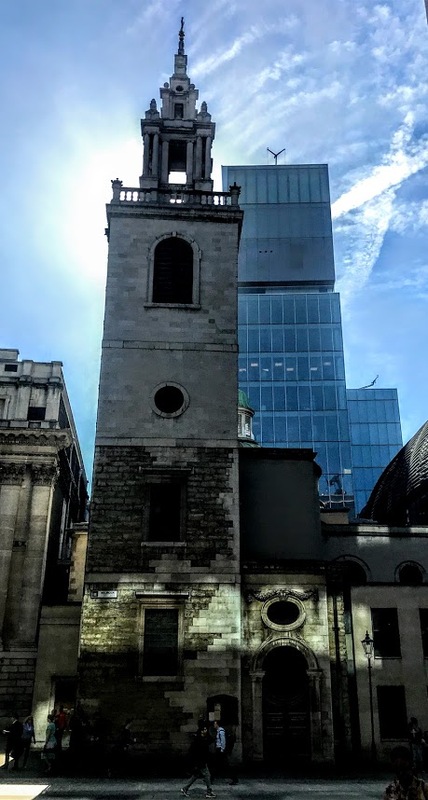 In 1428, Robert Chichely, acting as executor of will of the former Lord Mayor of London, Sir William Stondon, bought a piece of land on the east side of the Walbrook from the Grocers' Company to build a new, larger church, and presented it to the parish. Several foundation stones were laid on 11 May 1429, and the church was consecrated on 30 April 1439. This church was 38 metres long (125 ft) long and 20 metres wide (67 ft), and was considerably larger than the present building. That church also had a memorial to the composer John Dunstaple. At the east end of the church was Bearbidder Lane, the source of the Great Plague of 1665. The church was destroyed in the Great Fire of London in 1666. The nearby Church of Saint Benet Sherehog was also destroyed in the Great Fire, was not rebuilt; instead its parish was united with the parish of Saint Stephen. The present church was built in 1672-1679 to a design by Sir Christopher Wren, at a cost of £7,692, becoming one of his largest parish churches. The church is rectangular in plan, with a dome and an attached north-west tower. Entry to the church is up a flight of 16 steps, enclosed in a porch attached to the west front. Wren also designed a porch for the north side of the church. This was never built, and the north door was bricked up in 1685 because it let in offensive smells from the slaughterhouses in the neighbouring Stocks Market. The walls, tower, and internal columns are made of stone, but the dome is of timber and plaster with an external covering of copper. The 19 metre (63 ft) high dome is based on Wren’s original design for Saint Paul’s Cathedral. It is centred over a square of 12 Corinthian columns. The circular base of the dome is not carried, in the conventional way, by pendentives formed above the arches of the square, but on a circle formed by eight arches that spring from eight of the 12 columns, cutting across each corner in the manner of the Byzantine squinch. This all creates what many believe to be Wren’s finest church interior. The contemporary carved furnishings of the church, including the altarpiece and Royal Arms, the pulpit and font cover, are attributed to the carpenters Thomas Creecher and Stephen Colledge, and the carvers William Newman and Jonathan Maine. The spire was added to the square tower in 1713-1715 as were the square urns on the tower balustrade, and may have been designed by Nicholas Hawksmoor. The design is similar to those of Saint James Garlickhithe and Saint Michael Paternoster. The architect Sir John Vanbrugh was buried in the north aisle of the church. George England provided a new organ in 1760. The central window in the east wall was bricked up in 1776 to allow for the installation of Benjamin West’s painting, Devout Men Taking Away the Body of Saint Stephen, which was commissioned for the church by the rector, the Revd Thomas Wilson. Wilson also set up a statue of the radical Whig republican historian, Catharine Macaulay (1731-1791), in the church the following year. Macaulay was still alive and Wilson admired her political ideals, but the statue was removed after protests. The east window was unblocked and West’s painting was moved to the north wall in 1850 during extensive restorations. The church suffered some bomb damage during the London Blitz in 1941. It was restored after World War II, was designated a Grade I listed building in 1950, and was rededicated in 1954. The united parishes of Saint Mary Bothaw and Saint Swithin London Stone, which were merged in 1670, were united with Saint Stephen’s in 1954. The church was closed for structural repairs from 1978 to 1987. Chad Varah’s son, Andrew, built chairs to replace the pews as part of this programme of repairs and reordering. 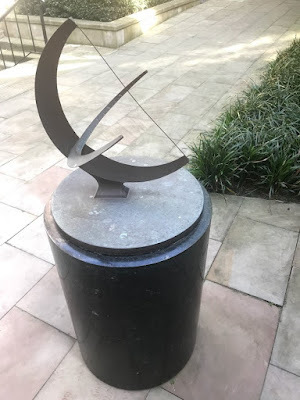 But the greatest great controversy followed the installation of a large circular altar in travertine marble by Henry Moore (1898-1986), commissioned by Varah and his churchwarden, the property developer and art collector Peter Palumbo, later Lord Palumbo and chair of the Arts Council. This massive white polished stone altar was carved in 1972 and was installed in the centre of the church. Its unusual positioning required the authorisation of a rare judgement of the Court of Ecclesiastical Causes Reserved, which granted a retrospective faculty for its installation. By carving a round altar table with forms cut into the circular sides, Henry Moore suggested that the centre of the church reflected the Dome of the Rock in Jerusalem, commemorating the sacrifice of Abraham and Isaac as a prefiguring of the sacrifice of Jesus Christ on the cross and the place for the offering of the Eucharist at the heart of worship. This place was designed for people to gather as a community around the altar where God could be found at the centre. A circle of brightly coloured kneelers designed by Patrick Heron (1920-1999), was one of Britain’s foremost abstract painters, was added around the altar in 1993. West’s Devout Men Taking Away the Body of Saint Stephen, which once hung on the north wall, was put into storage following the reordering. This decision was controversial, as the initial removal of the painting was illegal. In 2013, the church was given permission to sell the painting to a foundation, despite opposition from the London Diocesan Advisory Committee for the Care of Churches, and by the Church of England’s Church Buildings Council. The foundation has since loaned it to the Museum of Fine Arts in Boston, which has undertaken restoration work on the painting. The pleasant tree-lined and largely paved raised churchyard is tucked behind Saint Stephen’s, bounded by wall topped with iron railings, with access from Saint Stephen’s Row through ornamental gate flanked by fine stone piers with steps up to churchyard garden. Today the churchyard has seats and modern sculptures. ‘O God, make the door of this house wide enough to receive all who need human love and fellowship, narrow enough to shut out all envy, pride and strife. ‘Make its threshold smooth enough to be no stumbling-block to children, nor to straying feet, but rugged and strong enough to turn back the tempter’s power. The list of rectors includes Henry Pendleton, the ‘Vicar of Bray,’ several divines, one of whom was later sent to the Tower of London, and the Revd Robert Stuart de Courcey Laffan (1853-1927), who was born in Dun Laoghaire and who helped Baron Courbetin to revive the Olympic Games. Charlotte and Anne Brontë visited Saint Stephen’s Walbrook, on their first visit to London, hoping to hear Croly preach, as he was by then a famous author and cleric. Unfortunately, he was absent that Sunday. Croly was buried at Saint Stephen Walbrook, where there are and memorials to him, his wife, daughter and eldest son. But, undoubtedly, the best-known rector of Saint Stephen’s must be Canon Chad Varah (1911-2007), who founded the Samaritans, the world’s first crisis hotline telephone support for people contemplating suicide, in 1953. The first branch of the Samaritans met in the crypt beneath the church. A telephone in a glass box in the church was the first telephone used by the Samaritans. Canon Edward Chad Varah was born in Barton-upon-Humber, Lincolnshire, on 12 November 1911, the eldest of nine children of Canon William Edward Varah, Vicar of Saint Peter’s. Edward Varah was a strong Tractarian and named his son after Saint Chad of Lichfield. According to the early historian of England, the Venerable Bede, Saint Chad had founded the 7th century monastery ad Bearum, ‘at Barrow,’ that may have stood in an Anglo-Saxon enclosure beside Barton Vicarage. Chad Varah studied Natural Sciences and then Philosophy, Politics and Economics (PPE) at Keble College, Oxford, and graduated in 1933. He then moved to Lincoln Theological College, where his lecturers included Michael Ramsey, later Archbishop of Canterbury. He was ordained deacon in 1935 and priest in 1936. He was a curate at Saint Giles, Lincoln (1935-1938), Saint Mary’s, Putney (1938-1940), and Barrow-in-Furness (1940-1942). He was then Vicar of Holy Trinity, Blackburn (1942) and Saint Paul, Battersea (1949). The Grocers’ Company offered him the living of Saint Stephen Walbrook in 1953, and he became rector of the Wren church. Chad Varah supported the ordination of women, but preferred the liturgy of the Book of Common Prayer. Despite the absence of a permanent congregation, his church remained popular for weddings, and he officiated at the marriage of Lady Sarah Armstrong-Jones, only daughter of Princess Margaret, to the actor Daniel Chatto in 1994. He became an Honorary Prebendary (canon) of Saint Paul’s Cathedral in 1975, becoming Senior Prebendary in 1997. He retired in 2003, aged 92, by which time he was the oldest incumbent in the Church of England. Varah began to understand the problems facing the suicidal when he was taking a funeral as an assistant curate in 1935, his first church service, for a 14-year-old girl who had taken her own life because she had begun to menstruate and feared that she had a sexually transmitted disease. Chad Varah also influenced my childhood reading habits because he was also closely associated with founding the comic The Eagle with another Anglican priest, the Revd Marcus Morris, in 1950. He supplemented his income by working as a scriptwriter for The Eagle and its sister publications Girl, Robin and Swift until 1961. He used his scientific education to be ‘Scientific and Astronautical Consultant,’ as he put it, to Dan Dare. He was the subject of This Is Your Life in 1961 with by Eamonn Andrews. Canon Varah was awarded the Albert Schweitzer Gold Medal in 1972, and became an Honorary Fellow of Keble College in 1981. He held several honorary doctorates, was made OBE in 1969, CBE in 1995, and a Companion of Honour (CH) in 2000, and he also received the Romanian Patriarchal Cross. When Chad Varah retired at the age of 92 in 2003, he was the oldest serving incumbent in the Church of England. His wife Susan (Whanslaw) was World President of the Mothers’ Union in the 1970s. Chad Varah died on 8 November 2007, four days before his 96th birthday. Until recently, the rector of Saint Stephen Walbrook was the Revd Jonathan Evens. 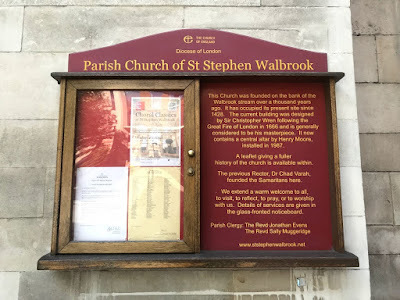 The Revd Stephen Baxter became the Parish Priest of Saint Stephen Walbrook in March 2018. He was ordained in 2014 and spent 3½ years as curate and then associate vicar of Saint Olave Hart Street and Saint Katharine Cree in the City of London. 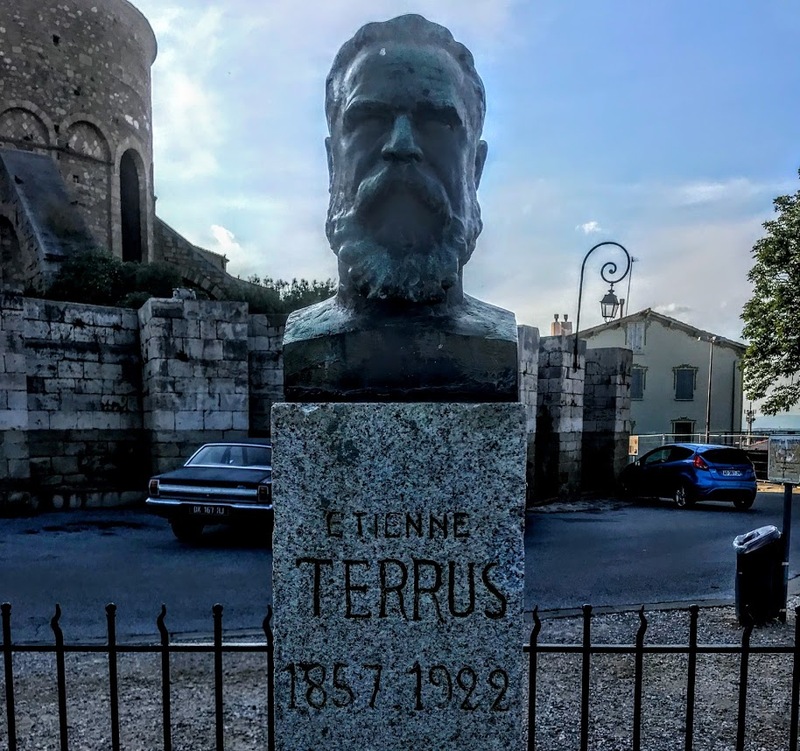 The French painter Étienne Terrus (1857-1922), who lived most of his life in Roussillon, is seen as one of the precursors of Fauvism. During his life, he worked closely with many of the artists who worked in Collioure in the south of France at the beginning of the last century, including George-Daniel de Monfreid, André Derain, and Henri Matisse. Although Terrus lapsed into obscurity for a time, he was rediscovered in the late 20th century. So, after a visit the week before last [17 May 2018] to Collioure, the coastal resort where Terrus and Matisse had worked, it seemed appropriate to our friend that on our way back to Ste-Marie-Le-Pen we should visit Elne, the town where Terrus was born, did much of his work, and died. 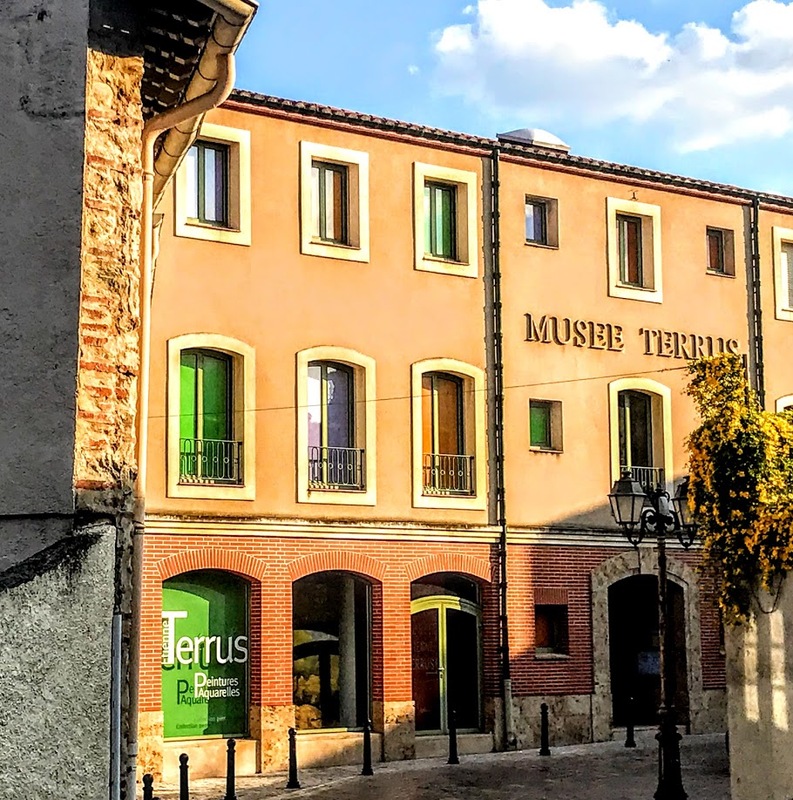 The Musée Terrus, a museum dedicated to his work, opened in his home town of Elne, near the French border with Spain, in 1994. Then 20 years ago, a major exhibition of what were believed to be his major works, Le Roussillon à l’origine de l’Art Moderne, was held in Perpignan in 1998. However, when we arrived in Elne that Thursday evening, the Terrus Museum was closed. Initially we thought this was because we had arrived too late in the day. But soon we were told how in recent weeks it was discovered that more than half the collection in the museum, 82 paintings, have been identified as counterfeit works. The council in Elne bought the paintings, drawings and watercolours for about €160,000 for the museum over a 20-year period. Some paintings were bequeathed by collectors, others were bought through fundraising efforts. But staff at the museum were not aware of the forgeries until a visiting art historian alerted them earlier this year. The Étienne Terrus Museum commissioned the art historian Eric Forcada to rehang its collection following the recent restoration of the building. During his assignment, Forcada discovered that 82 paintings – or about 60 percent of the museum’s holdings – were not painted by Terrus. Forcada said he noticed the works were fake almost immediately. ‘On one painting, the signature was wiped away when I passed my white glove over it,’ he told the Guardian. ‘At a stylistic level, it’s crude,’ Forcada said, referring to the fakes. ‘The cotton supports do not match the canvas used by Terrus. And there are some anachronisms.’ For example, some of the paintings show buildings built after Terrus had died, France 3 said. The art historian informed the region’s cultural minister and convened a panel of experts, who confirmed his suspicions and agreed that 82 of the 140 paintings and watercolours that have been on display in the museum for more than two decades were not painted by Terrus. The news was announced a few weeks ago as the museum was opening following a renovation. Local people are shocked, including the Mayor of Elne, Yves Barniol, who has apologised to people who have visited the museum in good faith. ‘I put myself in the place of all the people who came to visit the museum, who saw fake works, who took a ticket of entry, whatever the price,’ he said. The mayor has now opened an investigation into the forgeries and he insists those responsible will be caught. ‘We’re not giving up,’ he has told journalists. The town hall has filed a complaint against those who ordered, painted, or sold the fake paintings. A legal complaint has been filed, the fakes have been seized by police and French police have launched an investigation into the alleged forgery and fraud. Police also believe other museums may have been similarly duped; they suspect an organised ring. 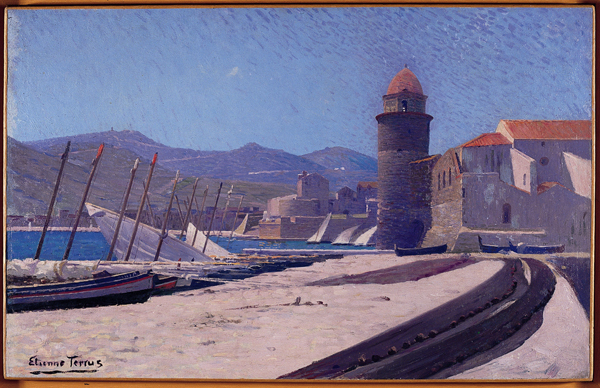 It is now thought that works by other regional artists in other locations near Perpignan and Collioure may also be fakes.